SCOTWISE: CHURCH IN GLASGOW - One of the world's endangered places! CHURCH IN GLASGOW - One of the world's endangered places! Treasures of the world are under threat! A GLASGOW church designed by Alexander "Greek" Thomson, a Roman aqueduct in Spain, New York city's hotly debated "lollipop building" and the entire architectural heritage of Iraq are now among the world's most endangered places. The World Monuments Fund (WMF) yesterday released its 2006 list of the 100 most-threatened precious sites. For the first time, the conservation charity has included an entire country, in recognition of the recent conflict that has engulfed Iraq - regarded by many historians as the cradle of civilisation. The study claims many of the estimated 10,000 sites in Iraq, chronicling thousands of years of human history, are at risk from war, looting or neglect. 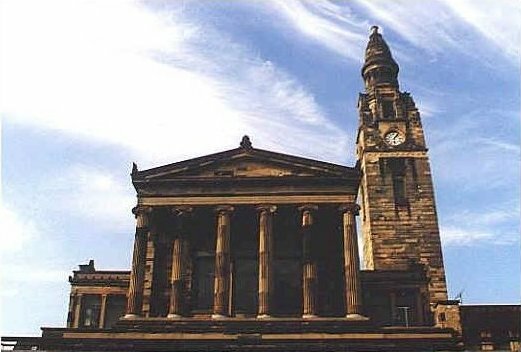 Closer to home, the 1859 St Vincent Street Church in Glasgow, which has appeared on the WMF's annual shortlist three times already, was among other structures listed as endangered. The WMF has consistently criticised its current owners, Glasgow City Council, for failing to restore the building. The church was built by Alexander "Greek" Thomson, who is responsible for many of Glasgow's distinctive neo-classical 19th-century buildings. At present, restoration work is being held up by difficulties in finding a viable financial use for the church, which is currently used by a congregation and charities, though there is speculation that Historic Scotland could become more involved in the project. Pastors vow to go to jail on hate case! MY BOOKSHELF TAG - CHALLENGE BY CATEZ!